This book provides guidance on research methodologies and methods with particular attention to applications in construction. It comprises three main sections: producing a proposal, executing the research and reporting the results. The book discusses the main issues in research and examines the primary approaches - both qualitative and quantitative. The methods adopted for scientific and engineering experiments, model building and simulations are discussed, as well as those employed for research into management, social and economic investigations.It examines the requirements for data and analysis, including the important statistical considerations and techniques that enable the researcher to appreciate the issues to be evaluated in devising how research may be carried out effectively and efficiently in the practical environment of modern construction. The second edition has extended the scope of the coverage, particularly in the area of qualitative research. It provides guidance to instil rigour in problem solving and in the production of reports and publications. It will be of value to construction, surveying, architecture and civil engineering students undertaking research, whether for bachelors and masters degree dissertations, or for masters and doctoral research degrees. Richard Fellows is an Associate Professor in the Department of Real Estate and Construction, University of Hong Kong. He graduated from the University of Aston and has worked as a quantity surveyor for several major contractors. He has a PhD from the University of Reading, was co-ordinator for research in construction management for the Engineering and Physical Sciences Research Council in the UK and has extensive experience in research and teaching in many countries. Anita Liu graduated from the university of Reading and returned to Hong Kong to work in industry, quantity surveying consultancy and for the Hong Kong government. She has carried out many research projects and gained her PhD from the University of Hong Kong. She is currently an Associate Professor in construction project management in the Department of Real Estate and Construction, University of Hong Kong. 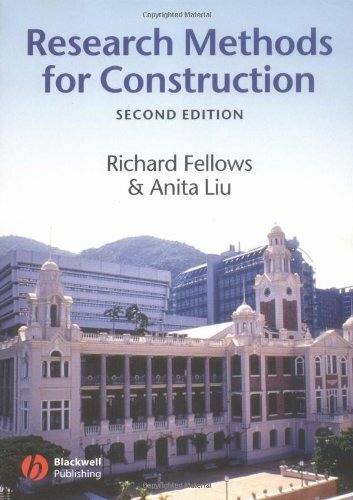 Fellows, Richard F., Liu, Anita M. M.